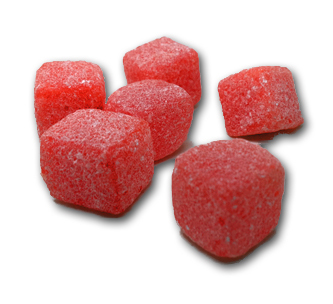 Traditionally called “Kola Cubes”, they’re an old school British boiled sweet. Old as lemon sherbets, rhubarb & custard candies, and acid drops. The Brits have a rich history of beautiful hard candies (that they called “boiled sweets”), much like the US. But whereas we have Starlight mints and Brach’s butterscotch drops, they have actual delicious, interesting items. 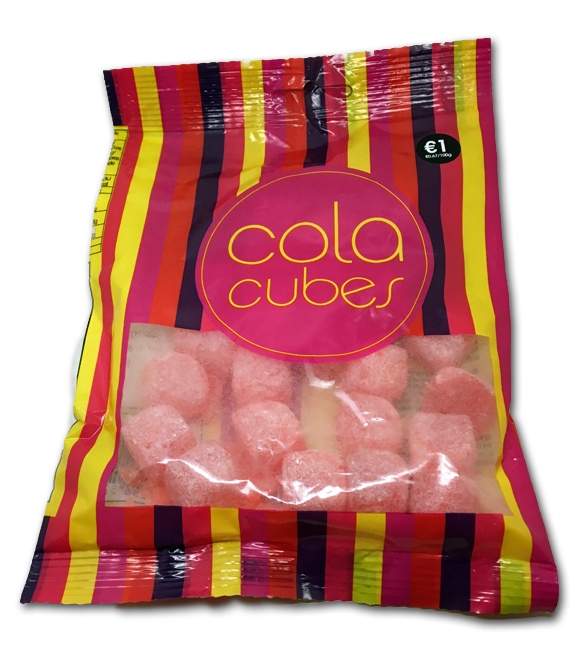 I’ve always been interested in Cola Cubes, because I love cola candy. But I’ve yet to find a great one. Until now? First question, and this relates to all cola cubes: why are they red? No one knows. But they’re relatively large hard candies-each piece is kind of a mouthful, which is fine, I don’t discriminate on size. My issue with these, and every other cola cube I’ve had, is that they’re bland. The flavor is anything but in the forefront, it’s more of a gentle essence of cola, and a pretty sweet one at that. I prefer my cola candies to have more zing, and to be a bit more complex. Cola has a lot of things going on in it, lots of spices, effervescence, and interesting flavors: to make a muted candy out of it doesn’t make sense to me, but it sure seems to for the Brexiters. I mean, they have to like these, right? They’ve existed for well over 50 years & haven’t seemed to change at all. So I’m scratching my head a bit over here. These are far from “bad”, I just don’t think they’re worth buying. So they got that going for them, which is nice. dont refer to us as brexiters! half of us wanted to stay!! best candy blog tho, please dont stop. Thanks, and I bet you’re right. Which ones would you recommend? This Is England brought me here. Looks like you tried a sort of no-name “Dollar General” brand there. There’s probably 10 manufacturers of Kola Kubes in the UK, keep looking! The best ones are brown, taste strongly of cola and have a little chewy bit in the middle.